earth-friendly elements like LED lights and waterless urinals. The downtown development train kept rolling with a plethora of projects getting the go-ahead – and even digging up dirt – in recent weeks. The office building will also prioritize employees’ use and enjoyment of the natural environment around them. According to a press release, the top floor will include a 2,500-square-foot common space allowing workers to take in the best views of the park and the river. In addition, all employee workstations will be located near windows. The new building will also accommodate employees who want to bike to work or exercise during the workday, and will include locker rooms, indoor bike storage, and an outdoor tire filling station which will also be open to parkgoers who want to fill up their bike tires or even inner tubes for a float down the river. JAMF, which creates software for Apple computers and devices, has grown from four to 110 employees in Eau Claire in the past five years. The Minneapolis-headquartered company was founded in 2002 by Zach Halmstad, a UW-Eau Claire graduate, and now has offices in four states as well as Amsterdam and Hong Kong. The new office, which is slated for completion in 2014, is being built on what was formerly a parking lot for the RCU corporate office. 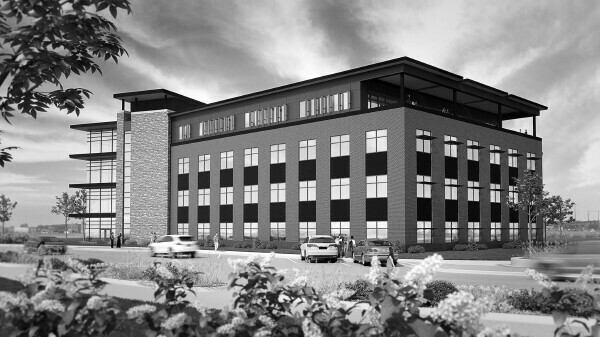 RCU is financing the project, while Ayres Associates is providing architectural and civil engineering work and Market and Johnson is managing the construction.